Description of "The U-turn (From India to Bharat)"
Presently working in Bharat Heavy Electricals Limited as Addl. General Manager. Literary activities: Interest in Hindi, English and Rajasthani literature. -- Mathematics--How to calculate the nth root of a positive real number (Copy Right). 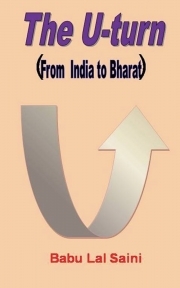 Reviews of "The U-turn (From India to Bharat)"
An excellent book as it provides solutions for many of our national issues . This may guide our leaders and administrators to take decisions in a better way while addressing the issues like social, cultural, environment, sports etc. A must read book for all the patriotic Indians.